Here is a list of the test chips we have submitted to date along with some test results. See our Slide Archive for more presentations which have been given on these chips. ASD99A due Mar 99 ASD Lite final prototype with improved input ESD protection. ASD98B Nov 98 ASD Lite prototype. 4 identical ASD channels. Fully differential. Tail-cancellation shaping, disc, LVDS outputs. Several new features to reduce crosstalk and increase stability. Now being tested; preliminary results are as expected. ESD98A Apr 98 Dedicated ESD (electrostatic discharge) protection chip. 16 input with different combinations of ESD structures and pre-amps. ASD97C Apr 98 Test to optimize preamp size (2 options), LVDS driver type (2 options) and baseline-resoration (with/without). ASD97B Feb 98 Preamp, shaper, baseline-restoration. 3 identical channels with linear output. ASD97AP Nov 97 Second 0.5um HP chip. Preamp, shaper, plus discriminator and LVDS output. ASD97A Apr 97 First test in 0.5um HP process, 3.3V power supply. Includes preamp and new pole/zero tail cancellation shaper. Most features of this chip could not be tested due to a processing problem which resulted in the capacitors being omitted from the chip! ASD96B First fully-differential preamp+main amp+discriminator (no shaping) This chip included further refinements in the preamplifier, many test structures for ESD protection, and LVDS (Low-Voltage Differential Signalling) outputs. Tested extensively on-chamber. The latest test chip demonstrates that a low-noise, high-gain amplifier can be integrated on the same chip as a fast timing discriminator. We have tested the amplifier noise performance, gain and timing performance, and found them to agree well with simulations. For details, see SLIDES and PAPER recently presented. 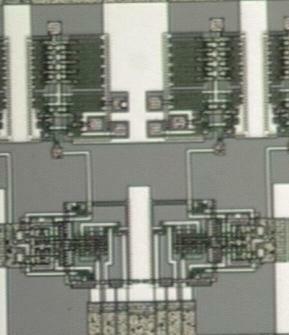 This chip was fabricated in Orbit 1.2u CMOS and consisted of four channels of charge-sensitive preamplifier, additional differential-amp stages, and pad drivers. The design was made carefully symmetrical and fully differential to minimize channel-to-channel offsets. With this chip we were able to confirm the preamp operation and low offset voltages. Unfortunately due to a layout error we were not able to measure the noise performance. 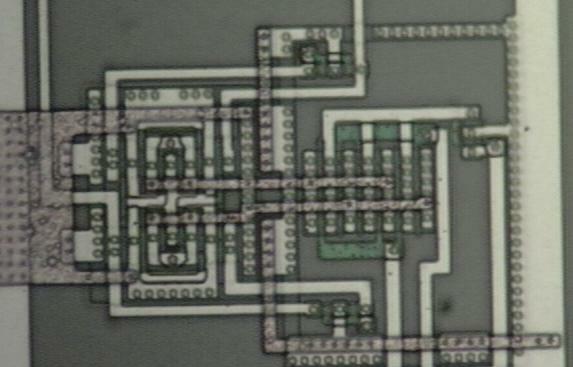 We have fabricated and tested an Orbit 1.2 micron CMOS test chip with three different discriminator designs. 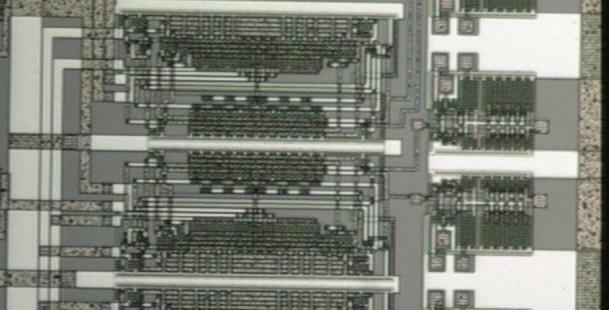 This chip proved that high-performance timing discriminators can be integrated in standard CMOS. 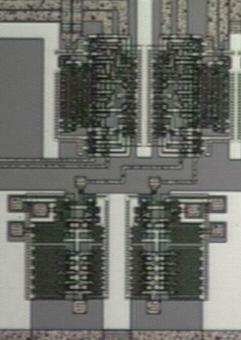 There are three designs, "small", "medium" and "large" (referring to the size of the input transistors). The medium and large designs have externally programmable hysteresis. The small design illustrates that the required performance can be achieved in a very compact layout.